The Skin Of What Fruit Causes Poison-Ivy-Like Reactions In Many People? Which Country Was The First To Launch A Domestic Non-Military Satellite? 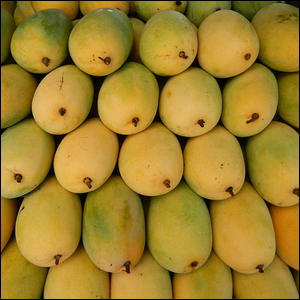 Mangoes are a flower fruit-bearing tree in the Anacardiaceae family. Other notable members of the family include the cashew tree, sumac trees, and, of importance to our bit of trivia today: poison ivy. The chemical compound that makes poison ivy so irritating to our skin is urushiol, an oily organic liquid. Mangoes, relatives of the poison ivy plant, have trace amounts of urushiol in their skin and a significant amount of urushiol located in their pedicles (the stump of the stem and the stem structure). While some people are able to eat the skin of a mango without any ill effect, many people report hyper sensitivity and irritation in their mouths and throats, as well as upset stomachs after consuming the tough skin of the mango. Even those that can eat the mango skin with no ill effect avoid the pedicle, however, as it contains enough urushiol to blister the skin and create the same type of irritation as exposure to poison ivy. Image by Ramon F Velasquez.